In ancient civilizations like the Greek and the Roman, they believed and feared a lot of gods. One of the “big three” or the most powerful is Neptune or Poseidon. Neptune is the god of the seas and since the main trading and travelling route during those times are at seas, people pray to him for safety. A lot of tattoo enthusiasts love the ancient gods and how classical art illustrates their faces through statues and paintings. Because of this, a lot of tattoo designs were created from the images of these gods. In this post, we collected the best Neptune tattoos out there. 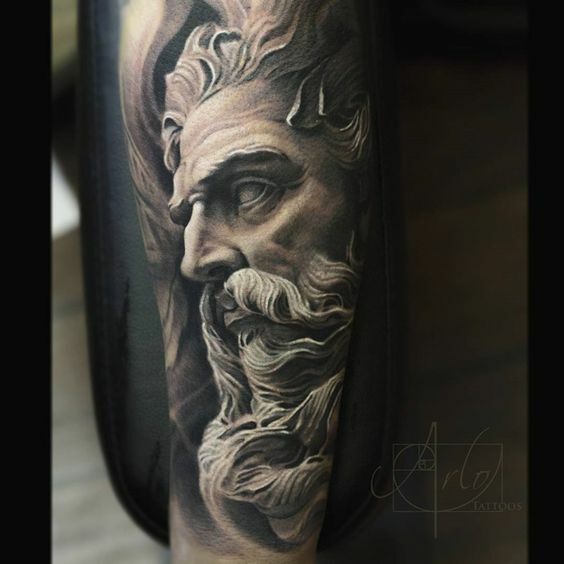 Most of the tattoos showcased are rendered in black and white while copying the face of Neptune in a classical way. There are also Neptune tattoos showing his might over the seas by emphasizing his trident, steed, and his conjured weapons that causes ocean disasters. This collection is much like an art subject because of how the tattoo artists inked Neptune into the skins of their satisfied customers. Enjoy the tats everyone.